New Years resolutions are the best. There are two kinds of people: those who scoff at the idea of resolutions because they are stupid because you shouldn’t need to change things on some arbitrary date, and there are those who can write their own destiny and actually change things in their world. This year I vowed not to eat chocolate for the whole year and as I sit here on the 31st of December, I have managed this feat. I made the resolution partially as a health thing but mostly just to see if I could do it. I like chocolate chip cookies, and brownies, and chocolate milkshakes, so I knew this would be hard enough to be a test. And it was. I had to turn down offers pretty consistently but now that I’ve done it, holy cats do I feel good about it. I know that I control my world, I am the master of my desires. The fact I could do this has become this insane mental victory that you can’t pay for in this world anymore. I have bested temptation; come at me, bro. Though I didn’t exactly go the ‘whole’ year without chocolate 😦 — at a work function I bit into what I thought was a blueberry muffin but upon first bite discovered it to be chocolate chipped. I didn’t want to look insane so I swallowed my small bite and then tossed the rest in the trash. I hope when I reach the pearly gates that St Pete doesn’t pull this on me and cast me down. So, looking ahead for 2014, I had a big hole to fill. 2013 saw me master my fleshy temptations, what could I do for 2014 that would best this? In the end, I’m not being negative and redacting something from my world (I know I can do this now), so instead I’m going to value add. In no particular order, here are my 2014 resolution. Read A Comic A Day – this should seem easy but some days get hectic and I don’t read anything and it bums me out. I’m busy and blah blah blah but if I’ve got time for someone’s facebook status/tweets, then I’ve got time to finally read the Jason Aaron GHOST RIDER omnibus I’ve ignored for far too long. This year, I read at least 365 comics. Exercise 10 Minutes Every Day, 6 Days A Week – the usual standby resolution of ‘this year I’m going to get fit’ is dumb. It’s not clear what you’re going to do and so you’ll most likely fail. Because people don’t plan to fail, they fail to plan, and ‘get fit’ isn’t the tightest term and once unloosely defined you’ll never rein it in and then you’ll find it unattainable. I’m beating that by making mine specific AND achievable. Hence, just 10 minutes a day. It can be walking, riding, stretching, bridging, sit ups, arm workouts, whatever. Considering I’m starting teaching at a new school that is closer and I plan to walk/ride most days, this will hopefully be a lock. But I’m hoping the 10 minutes becomes infectious and leaks out into more. I also think the break day every week is just smart planning. But for now, start small, achieve, and move on/up later. List My Input – I’m going to keep lists on the comics/books/movies/tv I consume. I have a notepad all set out for this. Why am I doing it? Well, to help me keep on track with the aforementioned #365comics challenge, but also to just look at what I’m doing, see patterns, and have something that will replace my Swiss cheese memory. Write Harder – I’m going to settle into tasks quicker, I’m going to go social media free while writing for a few nights a week, and I’m going to ensure I keep my productivity high. This one is a little loose, I will admit, but I feel happy with how I’ve been going in 2013 on this one (which is an every year event and constantly improving/evolving) but I always want to up my game so for 2014 the ‘net free nights is what will help me out. So will the deadlines on real gigs with real publishing schedules. These are my resolutions. They will make me and 2014 better things in this world. I hope you have resolutions, I hope you crush them, and if I can help in any way just let me know. STRANGE NATION #3 is available on ComiXology right now. For 99c get this great issue from Juan Romera + Paul Allor in a series that’s one of my current favourites. And if you haven’t caught up, all issues are 99c so you can get into it cheaply and easily. You can also enjoy another column of HIGH LITERATURE & LOW MONSTERS by me where I discuss some key American icons from the past and their pulp portrayal in pop culture. This essay was a real blast to research and write so go check it out, too. As always, if you are buying digital know that buying directly from the site, and not via an app, bypasses the 1/3 bite Apple takes from all sales and puts more money into the creators hands. You can find STRANGE NATION on the ComiXology site right here. 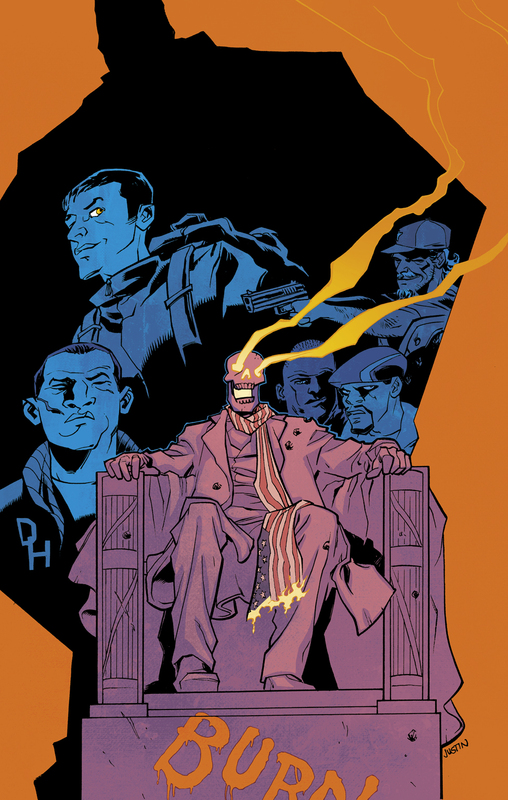 GHOST TOWN #4 is out this week – you can buy it for 99c on ComiXology right now! This issue brings to a close my 3 issue arc with Daniel J Logan and Brian V Dyck which ran from issues #2-4. The arc, Godfathers & Daughters, was a lot of fun to write and seeing Daniel and Brian bring it all to life was spectacular. I felt like we did good work on this conclusion to what is just the start of Nate Lawson’s story. What comes next, and I hope we get to tell all of it, is all built upon the final pages of this issue. We break the man here and will analyse the pieces later. To those of you who have been reading GHOST TOWN, I want to thank you. I know it’s hard to diversify your pull list every week, hard to find all the money for all the good books out there, and your time and kind words have been fantastic. I hope you’ve enjoyed this arc and that you’ll come see the other books I’ve got cooking up for 2014. As always, remember to remind your LCS if you like these smaller titles, and if you are buying digital know that buying directly from the site, and not via an app, bypasses the 1/3 bite Apple takes from all sales and puts more money into the creators hands. 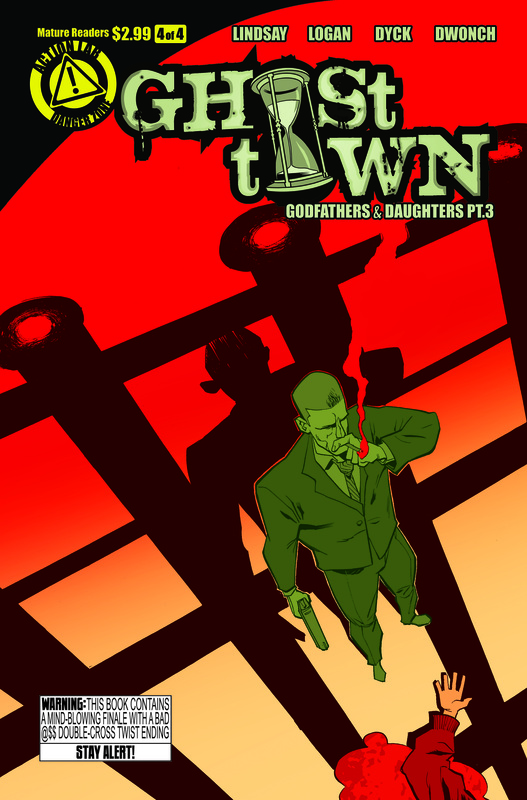 You can find Ghost Town on the ComiXology site right here. It’s been a pleasure having 3 issues to tell this part of Nate’s story and I cannot thank Daniel and Brian enough for dropping bombs, and Dave Dwonch for bringing me aboard and helping me tell this tale, and Rob Ruddell for creating the premise in the first place. This has been fun, let’s do it again some time. This page came about a few years back when I was tasked with writing a one-page comic about Santa Claus over at thoughtballoons (you can see it needed some beating up). The script always stuck with me because it was far too much fun to write, and because I always thought what came next was going to be really damn fun to write. Perhaps one day. For now, enjoy, and merry xmas. I’ll state it again, all of these characters are owned and copyright to Marvel Entertainment. I am not making any money off this publication nor trying to imply I have ownership or their right to make the page. This is just fun, I hope you agree. I wanted 2013 to be a year where my comic writing started to mean something. I wanted to see progression. progression in my quality, and progression in what I got out there to the masses. This quick post is just a personal timelog for me to reflect on but someone out there might find it interesting. 2013 was the year I finally started to get published, in many different ways. 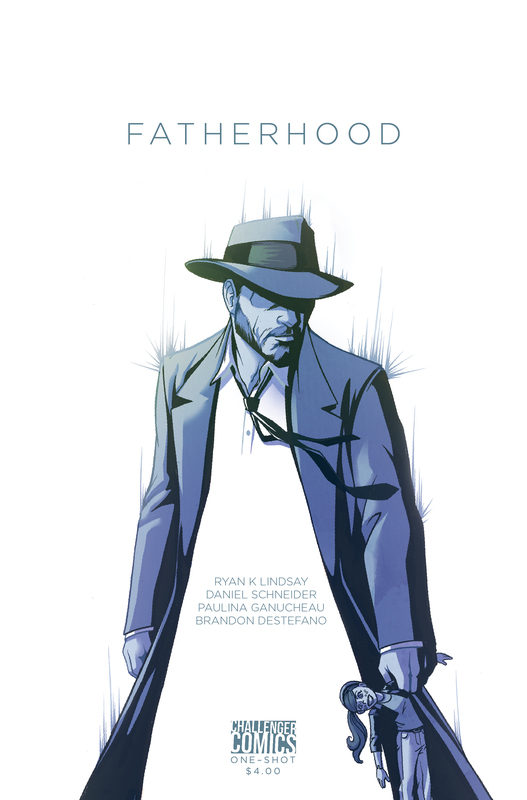 FATHERHOOD – the one-shot that started the deluge. 22 pages from Daniel Schneider, Paulina Ganucheau, Brandon DeStefano, and me. It sold well at cons, got good reviews, and I feel it was something that really represented what I wanted to be doing and where I wanted to be heading. I’m still really personally happy with this book. 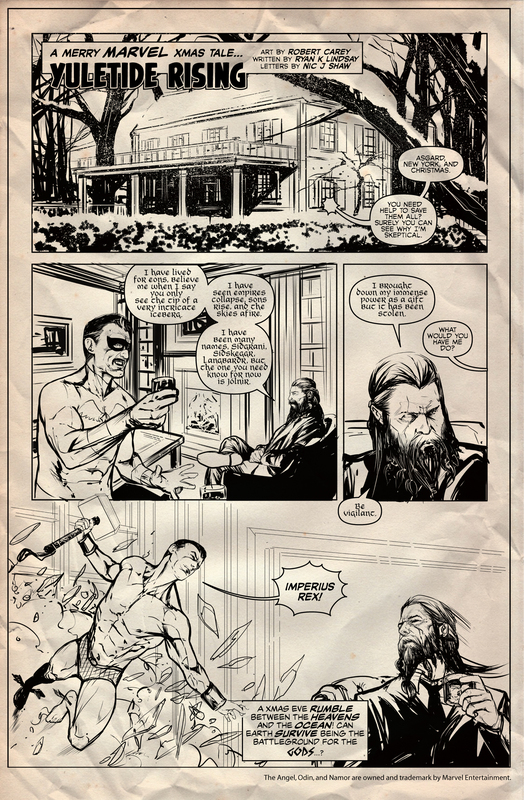 It is forevermore available for your peepers on ComiXology. 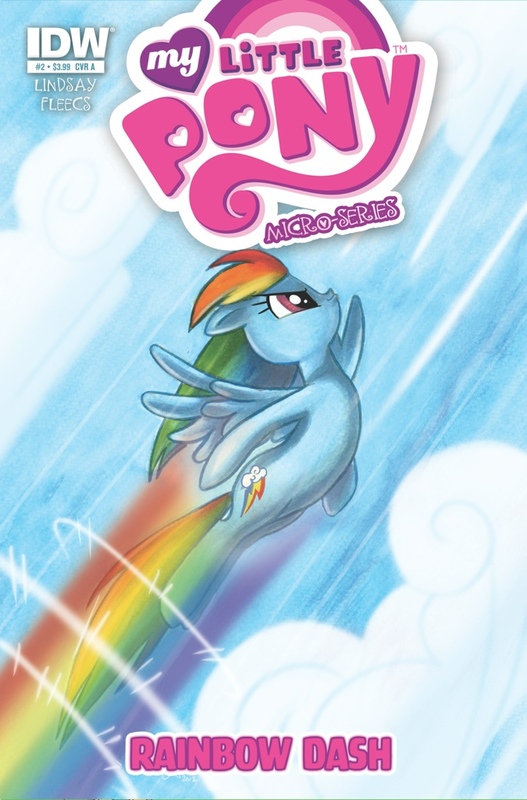 MY LITTLE PONY MICRO SERIES #2: RAINBOW DASH – a 22 page one-shot on the blockbuster comic licensed series from IDW, this sold in the Top 100 for its month and garnered strong prise. I think Tony Fleecs’ masterful art and colours helped that greatly, and ably assisted by Neil Uyetake’s letters. This issue is me tackling someone else’s characters – a whole fandom’s world – and trying to play in that sandbox while still keeping true to my own voice. It was hard, but complete fun. 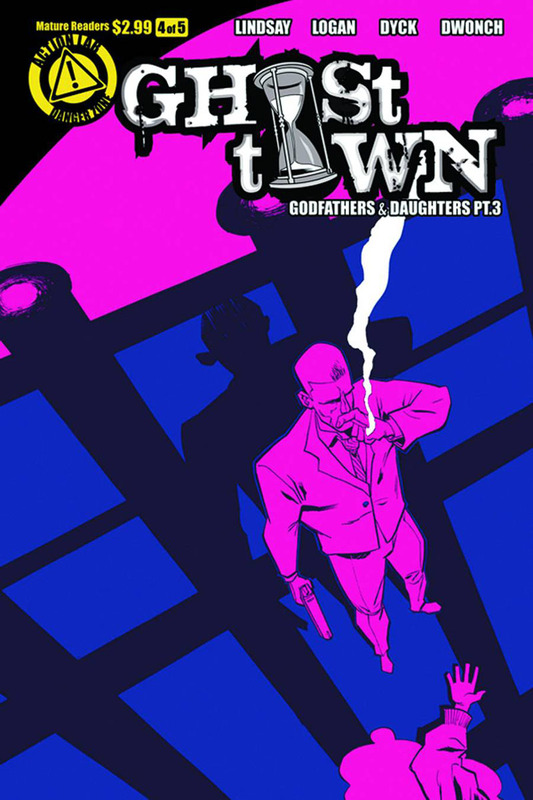 GHOST TOWN #2-4 – my three issue arc on Action Lab’s Danger Zone imprint title all came out across the year. Each issue is 22 pages from Daniel J Logan, Brian V Dyck, Dave Dwonch, and me. This was a fun yarn to put into the world, I really love some of the moments Daniel and I cooked up as we collaborated. I can’t wait to get the trade of this arc next year in March. OXYMORON: ALONE IN A CROWD – this 8 page short in the ComixTribe HC collection featured art by Daniel J Logan and was a sick load of fun to create. You can read it all snuggled up with one other short by Aaron Huston/Paul Allor on ComiXology for 99c. 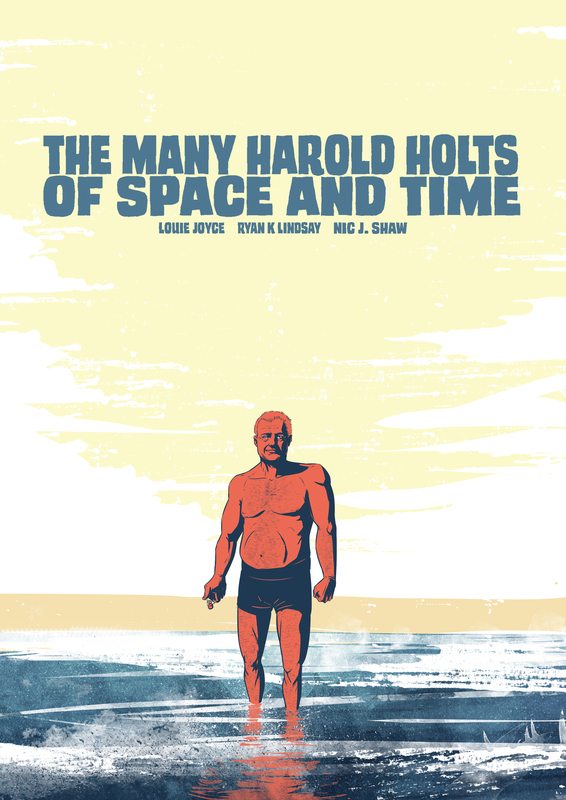 HOME BREW VAMPIRE BULLETS ZERO + #1: THE MANY HAROLD HOLTS OF SPACE AND TIME – this 8 page slice of pulp fu from Louie Joyce, Nic J Shaw, and I was far too much fun to put together, and it was done in a very tight amount of time. I stand by this being the best short I’ve ever written. This is a really tight tale and it has gotten strong press in any reviews of the issues. This is the sort of thing I’ll use to showcase my short game whenever I can. Interesting that it took me so many short before it before I felt I finally got one past the keeper and into the net. 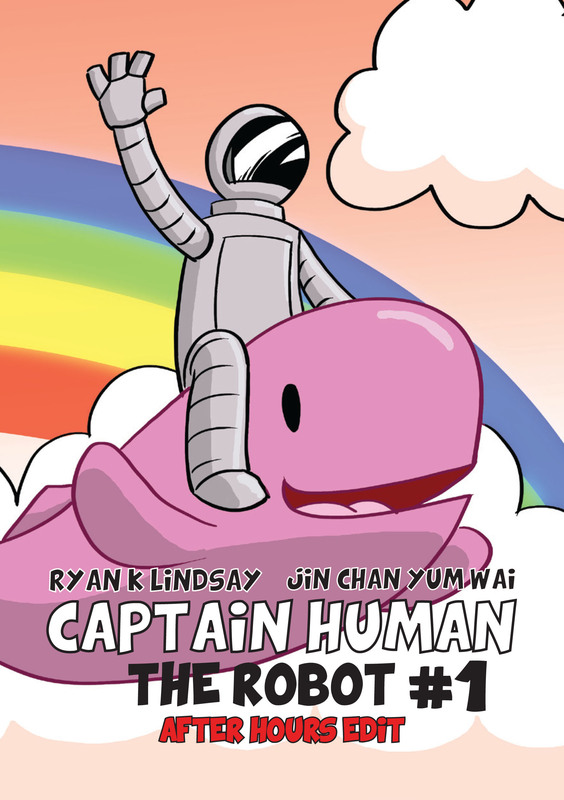 CAPTAIN HUMAN THE ROBOT: ALL AGES and AFTER HOURS EDITS – these small one-shots fro Jin Chan Yum Wai and I are two 8 page shorts that contain the same art but two totally different scripts. These issues are miles apart from each other – one peppy and kid friendly and the other pretty blue and adult – and both were insane fun to write. This is just making comics for the fun of it and collaborating with a mate. I hope to visit our old friend again some time soon. Damn, I’m very happy with that. That’s a huge step up. But it’s also a huge step up in quality, with Holt being an achievement I’m so proud of, Fatherhood being a personal tale, and MLP being successful on many fronts. 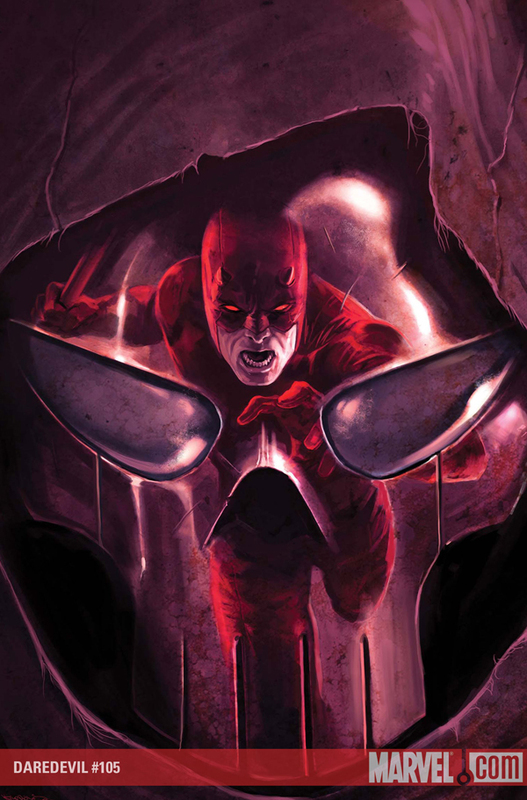 THE DEVIL IS IN THE DETAILS: EXAMINING MATT MURDOCK AND DAREDEVIL – a book of essays about Marvel’s daredevil character that came out from Sequart. This book got good reviews and it was a dream gig to edit this book into existence and contribute about 30k of words, or so, to it. And from this stemmed the Sequart Single of my essay about Matt Murdock’s love life, BLIND DATES + BROKEN HEARTS. 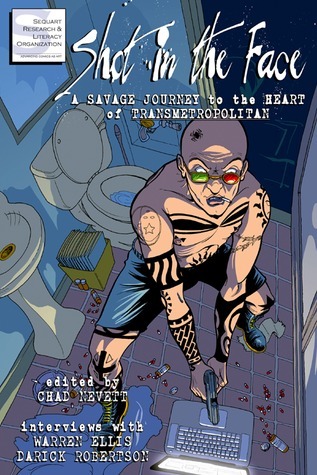 SHOT IN THE FACE: A SAVAGE JOURNEY TO THE HEART OF TRANSMETROPOLITAN – a book of essays about TRANSMETROPOLITAN from Darick Robertson + Warren Ellis. I wrote: Caffiene In My Fingers: Journalism Of The Future Via Zapruder Tweets and Woodward/Bernstein Feeds – and it was crazy fun. 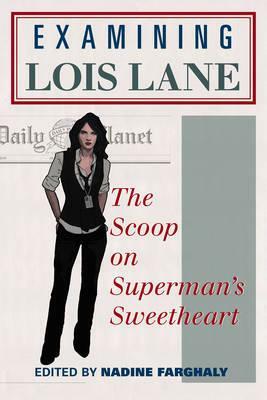 EXAMINING LOIS LANE: THE SCOOP ON SUPERMAN’S SWEETHEART – a book of essays about Lois Lane wherein I wrote Full Disclosure: A Statement of Love for Lois Lane, a discussion on ALL STAR SUPERMAN by Frank Quitely and Grant Morrison. 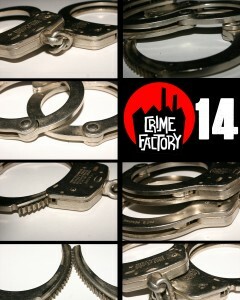 LEE – AND THE GUNSLINGER FOLLOWED: I had my first piece of prose fiction published in an anthology from Crime Factory. 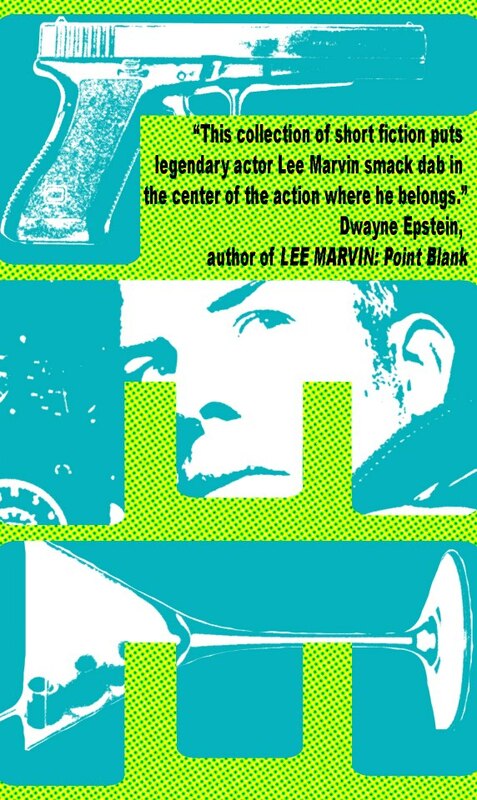 LEE is full of tales about and starring Lee Marvin. I got to write about old man Lee Marvin racing death. It was a real highlight. CRIME FACTORY 14 – SCRIBBLES FROM THE UNDERWORLD – a very short story I wrote about a crime pub and what gets left behind there. This amused me and I was stoked that the good people behind CF would see it fit to print. I can’t imagine how many people have not found this tale. Yet. 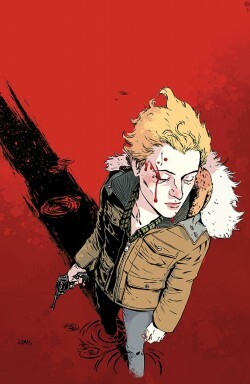 SHELTERED: PREPCAST NEWSLETTER BACK UP ESSAYS – I’ve been writing the preper essays in the back of Sheltered by Johnnie Christman, Shari Chankhamma, and Ed Brisson. A whole mess of fun, though it’s warping my mind. STRANGE NATION: HIGH LITERATURE + LOW MONSTERS BACK UP COLUMN: Paul Allor brought me on board his Monkeybrain Comics title to write back matter essays about pulp topics and their representation in media. This is the back matter I was born to write. The plan now is to have 2014 be even bigger. I want to see more pages posted, higher quality attained, and I don’t plan on looking back. Here’s hoping I can do it. As it stands, I already have solid plans to see 212 pages come along in 2014, with 79 of those pages already complete. One of these series I have seen a lot of and it is so damn fine. The other one, I also have all the faith in the world in. Here’s hoping in 12 months I post just as much praise. I honestly hope your writing year has been just as fine, no matter the style of writing you are doing. 10. David Mack – because Echo was a fantastic creation. 9. D.G. 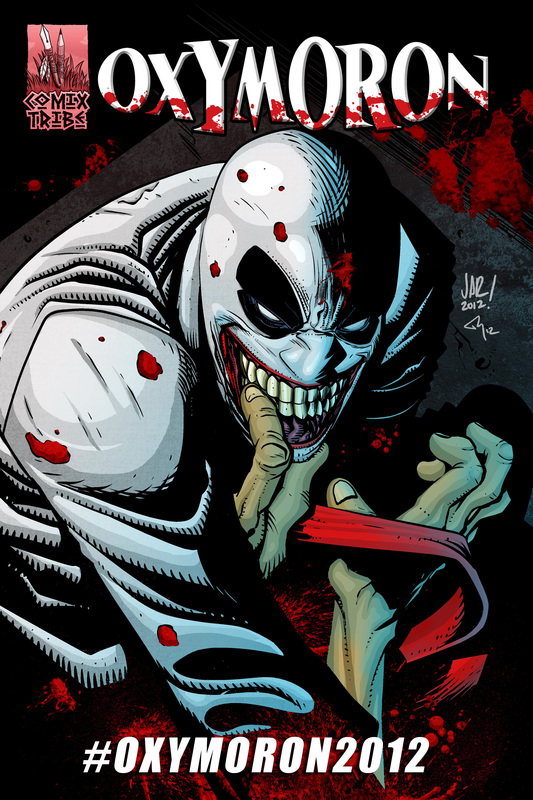 Chichester and friends – because his LAST RITES storyline is still gripping, plus he wrote #297, one of the best Daredevil issues ever, and one of the best Typhoid Mary stories ever. 8. John Romita Jr/Ann Nocenti – because they brought Typhoid Mary into brutal existence, and because they ended with Murdock and Bullseye really getting deep into their relationship. And because somewhere in between Murdock found himself in a Kerouac novel with Inhumans. 7. Gene Colan/Roy Thomas – because Gene Colan, that’s why. 6. Paolo Rivera/Marcos Martin/Chris Samnee/Mark Waid – because it’s really tightly wound and when it’s good, it’s masterful. The storytelling from Samnee is out of this world, and the Moleman story was haunting, and it’s fun but also so very smart. 5. Stan Lee and many friends – because there’s a whole mess of charm and insanity to love about this. But mostly, it’s for Mike Murdock. 4. Steve Gerber and friends – because he went nuts. 3. Alex Maleev/Brian Michael Bendis – because this is operatic crime at its best, everything works here so well and they end on such a high note. The whole run, this one grand novel, is brilliant. 2. Frank Miller, and Klaus Janson – because he actually produced the best Daredevil comics ever with his entire Elektra Saga. They are the pinnacle. These are must read classics. Even the What If? issue. And Roulette might be the best Daredevil issue of all time. Maaaaaybe (though maybe one of the first Born Again issues takes that cake, those issues are tiiiight). 1. 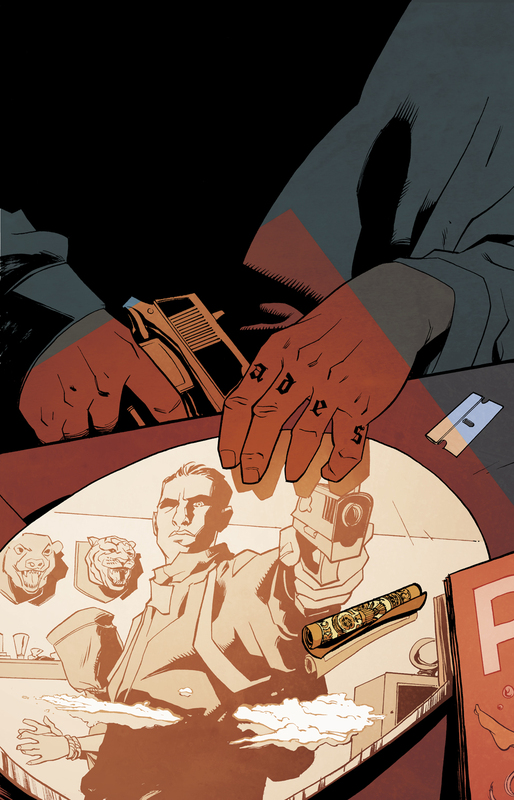 Michael Lark/Ed Brubaker – because this is my favourite. It’s pulpy, and lurid, and harsh, and so much damn fun. This run is exactly what I want from a Daredevil comic, jail, crimelords, Europe, ninja, infidelity, and just a sense that I was thumbing a worn 50s paperback with a gold medal in the top corner. I don’t expect nor demand my list align with anyone elses. I think that’s the power of Daredevil, even his core audience is divided and the fact we have so much quality to choose from stands to why Daredevil is the greatest character and book out there. 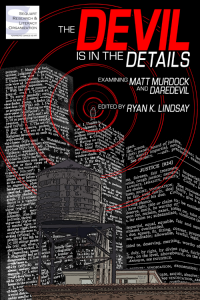 If you are curious about any of my other thoughts on Daredevil, you should go read the book I edited, and wrote in, from Sequart titled THE DEVIL IS IN THE DETAILS: EXAMINING MATT MURDOCK AND DAREDEVIL. I write at length about Daredevil’s love life, and then I deconstruct why the Lark/Brubaker run hits me so square. Others write about Mike Murdock, and the Punisher, and Hell’s Kitchen, and the whole history is on the table. As a mega-daredevil fan, it’s the book I needed to see in the world. 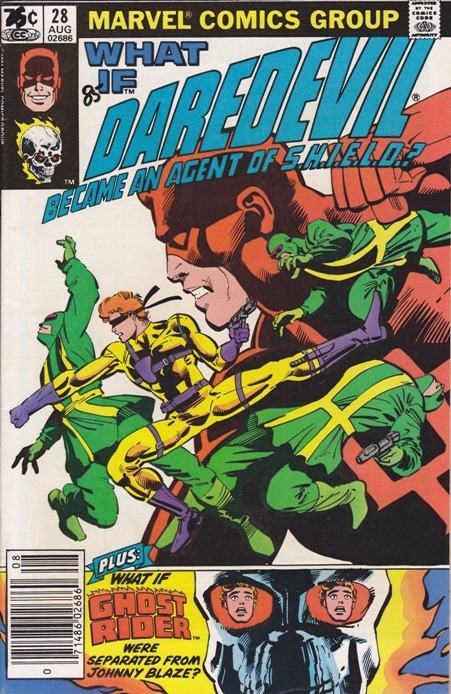 Note: I also once wrote for Robot 6 about what I feel are the 6 most widely ignored Daredevil stories. Enjoy.